Washington, D.C. has got a serious case of election fever. With the big day less than two months away, restaurants and bars all around the District are creating dishes, drinks and promotions that are inspired by the candidates, the political process and former Presidents. This hoptail from Bar Dupont is aptly named, as Hillary Clinton still has a lot more to do (and fingers crossed she'll get her chance after November 8.) Rye gives it a nice spicy bite, Guinness adds luxuriously creamy mouth feel, and demerara sugar syrup lends earthy sweetness. Recipe courtesy of Bar Dupont, Washington, D.C.
Add all ingredients except garnish to a cocktail shaker. Add ice and shake until chilled. Strain into a coupe glass, and garnish with the cherry and orange peel. Happy National Cucumber Day! (Yes, there is such a thing.) I don't know about you, but I totally gravitate towards any cocktail I see on a menu that has cucumber in it. Maybe it's the spa connotation, or just the fresh aroma and flavor they lend to libations, but the slender green vegetable can add the perfect je ne sais quoi to summer sips. In a mixing glass, muddle basil, cucumber, and simple syrup. Add Hendrick’s Gin, lemon juice, and ice. Shake well and fine strain into an iced double rocks glass. Garnish with a bunch of basil and a cucumber wheel. In Italian, "spagliato" means a mistake or a mess up. In this drink, it refers to a sloppy bartender accidentally replacing the gin in a Negroni with sparkling win. But let's call it a happy accident, as it renders a cocktail that's lighter, with more effervescence. This recipe is batched, making it perfect for any gatherings this spring or summer, from a Memorial Day picnic to a graduation party. Feel free to use whatever kinds of fresh fruit you can get your hands on at the farmer's market, from berries to peaches. Add the sweet vermouth and Campari to a punch bowl filled with large ice cubes. Add fresh fruit and top with the Prosecco DOC. Stir gently and serve. Verkalýðsdagurinn, also known as May Day or Labor Day, is celebrated in Iceland on May 1, when workers unite and show their solidarity in worker’s rights as they parade down the streets. Reyka Vodka has a cocktail to celebrate, no matter what your passport says. The Reyka R & R combines it with lemon and pear, and a hint of herbal from a rosemary-infused syrup. Add all ingredients except garnish to a cocktail shaker. Add ice, shake until chilled and strain into a hurricane glass over fresh ice. Garnish with the rosemary sprig or dried pear slice. Mardi Gras has come and gone, but New Orleans' classic Sazerac remains as one of those cocktails that never goes out of style (or season). Head Bartender Dan Rook at South Water Kitchen in Chicago created a smoother, more herbal and citrus-y riff, with Cognac as the main base spirit, and just a touch of the traditional rye for bite. Dry Curacao gives great orange flavor without sweetness, and Fernet Branca stands in for Absinthe. Add all ingredients to a cocktail tin. Add ice, and stir until well chilled. Strain into a rocks glass over a large ice sphere or cube. Whether you call them hoptails or beer cocktails, libations made with suds have appeal. Just like cocktails made with wine, those made with brews typically have tempered alcohol content (so go ahead, order another one), as well multi-dimensional flavor that doesn't require a laundry list of ingredients. This sip from Scotch Craft Beer producer Innis & Gun uses a rum-aged beer, along with aged rum, decadent raisiny Oloroso Sherry and chocolate bitters. Forget about a Chocolate "Martini" on February 14: this cocktail is complex, enticing and just a little bit sweet for your Valentine. Add all ingredients except the garnish to a mixing glass. Add ice, and stir until chilled and properly diluted. Fine strain it over ice in a rocks or brandy glass, and serve a piece of the chocolate alongside. I am just loving The London No. 1 Gin, not just for its gorgeous pale turquoise blue color (which looks stunning in a Martini), but also for its delicate notes of juniper, pine and ten other botanicals. I've had fun experimenting with cocktails that preserve its hue, but I'm also enjoying those that coax out its aromas and flavors. The G & Tea is a heady, feminine blend of elderflower,gin and intoxicating bergamot citrus from Earl Grey tea. I can see it being a staple on the patio this summer. Add ice, and all of the ingredients except the garnish, to a large rocks glass. Stir to combine, and garnish it with a lemon peel. At Denver's Session Kitchen, head bartender Les Baker has long believed that coconut and kaffir lime are a perfect match. Here, he uses them in an unexpected twist on one of the first vodka cocktails. “We steep the kaffir lime leaves to extract the flavor,” he explains, “and it adds a unique depth to the citrus component and creates a beautiful aroma.” Coconut sake gives that familiar, creamy tropical flavor, and the rice wine-based spirit adds a soft textural component. (If you can't find it, substitute coconut vodka.) For true authenticity, serve it in a copper mug with lots of crushed ice; if you don't have one, a Collins glass will do. Add the Kaffir Lime-Infused Vodka, Sake and lime juice to a copper mug. Add ice, and top it with the ginger beer. Garnish the drink with a lime wheel and fresh coconut. Add 20 leaves to a bottle of your choice of vodka. Let the vodka infuse for 10 to 14 days, shaking it occasionally. Strain out the leaves before using the vodka. Sure, Thanksgiving is over. But that doesn't mean we have to put that bottle of Wild Turkey back on the shelf. Bartender Christopher Longoria from 1760 in San Francisco created a riff on the Old Fashioned for Wild Turkey's second annual Give Back the Bird fundraiser. For the entire month of November, participating bars donated $2 from the sale of their specially created cocktail to the San Francisco Marin Food Bank. The promotion may be over, but this drink is a great addition to your fall and winter cocktail repertoire. Cynar, Campari and two kinds of bitters lend enticing herbal and bitter notes, while white Vermouth rather than red keeps the tipple on the drier side. You could even add a bit of sparkling water to this and serve it as an aperitif. Combine all except garnish in a mixing glass. Add ice, and stir until chilled. 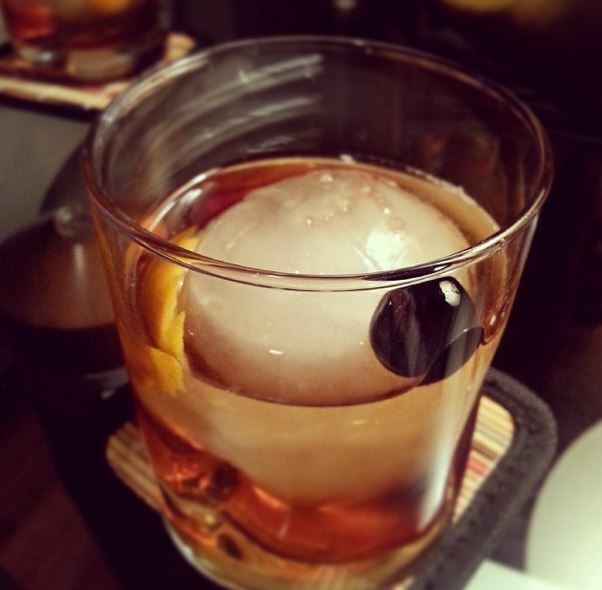 Strain over 1 large ice cube in a rocks glass, and garnish with a brandied cherry. Who doesn't like the bite of a frosty mug of sarsaparilla? The old-timey soda is even better when re-imagined as a cocktail. The Sarsaparilla Old Fashioned, created by Dallas' Eddie Eakin mixes the spicy flavors of Knob Creek Rye with Sarsaparilla, a traditional flavor originally used in Texas and the American West during the 1950s; vanilla and honey add a touch of sweetness. Root by Art in the Age is the best root beer liqueur out there, in my opinion. And if you can't find sarsaparilla bitters, substitute Angostura or barrel aged. Add the rye, honey syrup, Root, and bitters to a mixing glass. Add cracked ice and stir for 40 revolutions. Strain the drink over fresh ice in a rocks glass, and garnish it with the star anise pod and the brandied cherry. Build the drink in a wine glass over ice. Stir for 10 seconds. Garnish with a rosemary sprig and a little cracked pepper. For the rosemary maple simple syrup: Bring 8 ounces maple syrup and 2 ounces water to a boil. Add the 5 rosemary sprigs, remove the mixture from the heat, steep until cooled and desired flavor is achieved, and strain out solids. Store in the refrigerator. Blackberry Bourbon Lemonade at Yardbird Southern Table and Bar. Photo courtesy of Yardbird. I just finished writing a feature for Cheers Magazine about trends in American whiskey, and one of my sources was Yardbird Southern Table and Bar in Miami. The restaurant's signature cocktail happens to be Bourbon-based, and it's the overwhelming crowd favorite. Yardbird sold 10,000 Blackberry Bourbon Lemonades in the first quarter of this year alone! It's no wonder. This refreshing blend of Bourbon, lemonade and fresh blackberries (fresh is better, but frozen will work too) gets a touch of exotic flavor from a muddled cardamom pod (one of my favorite spices). It's topped with sparkling wine, and served over ice in a Mason jar. I really can't think of a more perfect summer cocktail, can you? Muddle the cardamom in a mixing glass, then add Bourbon, lemon juice, simple syrup and blackberry puree. Add ice, and shake until well-chilled. Strain into a Collins glass or Mason jar filled with ice, and top with a dry sparkling wine. Garnish with a lemon wheel and a fresh blackberry. To tie in with American Express' Centurion Lounges--complimentary dining experiences for Platinum Card and Centurion Card holders at airports around the country, PDT mixologist Jim Meehan has created signature craft cocktails based on local and seasonal inspiration that will be available at the lounges. The sparkling Centurion Spritz is perfect little pick me up in between flights (or to mix up at home when you just need a little boost). If you can't find Cappelletti Aperitivo, you can substitute Campari, Aperol or a combination of the two. Add all except garnish to a rocks glass filled with it. Stir gently to combine, and then garnish with the orange wheel. From The Thoroughbred Club at Belmond Charleston Place Hotel in Charleston comes this super summer sipper. The expression "cool as a cucumber" exists for a reason--it guarantees refreshment, especially on a 100+ degree day like we are having today in the D.C. area. The recipe calls for cucumber vodka, but I think it would be even more delicious with Hendrick's Gin. One ounce of it will keep you fresh, not fuzzy. Muddle the basil leaves and cucumber in a cocktail shaker. Add the lemongrass syrup, vodka and lemon juice. Add ice, and shake until chilled. Strain into a chilled Collins glass over fresh ice, and garnish with a cucumber wheel and a basil leaf. Add 1/2 cup sugar and 1/2 cup water to a small saucepan. Bring to a boil, remove from the heat, and add 2 chopped lemongrass stalks. Allow it to steep for 5 minutes, or until the desired flavor is achieve. Strain out solids, and store the syrup in the refrigerator until ready to use. Only one more day until we kick off the unofficial start of summer (and not a minute too soon...) If you are hosting a backyard party or barbecue this weekend, you want the drinks to be easy peasy (this is not the time to mix up cocktails with 100 ingredients a la minute.) The solution? This Tequila-based punch. 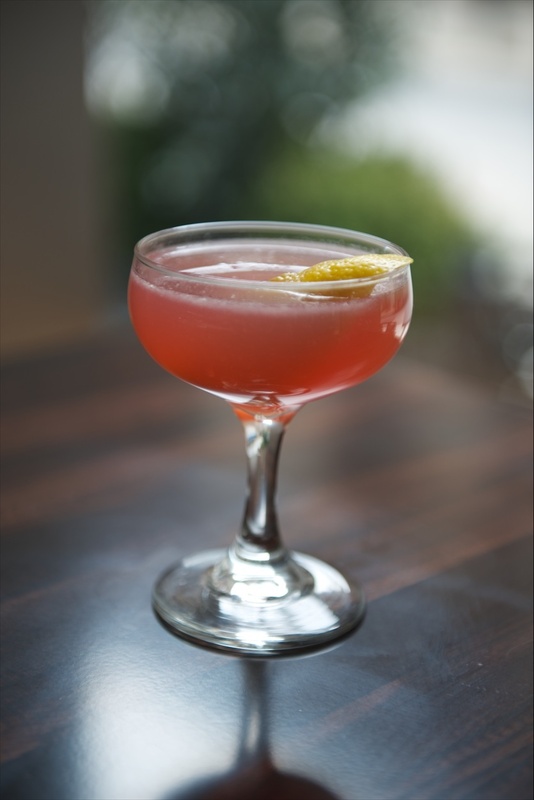 It's citrus-y and effervescent, with a floral undertone from hibiscus tea and the Lillet Rose, and a slight kick from ginger. You can build it in a punch bowl, over either a large block of ice (freeze water in a small Igloo cooler with the lid off, then chip off the bottom portion for a crystal clear block); or freeze water and lemon slices in a bundt pan or jello mold. Ginger juice is available in gourmet stores and some supermarkets. If you can't find it, substitute ginger liqueur and omit the simple syrup. Build the ingredients in a punch bowl over a large ice block, and garnish with lemon wheels. Stir well for one minute to dilute. Serve in a rocks or punch glass. Though the weather last night in the D.C. area may have shown otherwise (sleek, seriously? ), a peek at the calendar proves that it is indeed spring. This past winter has been like that party guest who won't leave at 2 a.m., even as he watches you clean up the last of the dishes and glasses and talk about how early you need to get up. Oof. But, the buds are breaking, the grass is getting greener, and we were wearing shorts last weekend. And this cocktail basically tells winter where to stick it. The liqueur formerly known as Rhuby is now called Rhubarb Tea (because of a legal battle...) But only the name has changed--it still has its appealing, mouthwatering tart and zesty flavor. The sip gets a citrus boost from Solerno and lemon juice (good thing, since that lime shortage is still going on...), and delicate florality from Lillet Rose. Just a few dashes of Absinthe give a signature whiff of anise. Add all except garnish to a cocktail shaker. Add ice, and shake until chilled. Strain into a chilled coupe glass, and garnish with the strawberry slice and mint sprig or edible flower. Though there is still snow on the ground here in the D.C. area, tomorrow (February 22) is National Margarita Day. While I'm always partial to the classic recipe made from scratch, with a Reposado Tequila, Combier and fresh lime juice, flavored versions made with high quality ingredients can whet my whistle, too. And nothing can bring a little bit of sunshine to a dreary winter day like the tart and tangy flavor (and vibrant hue) of pomegranate. 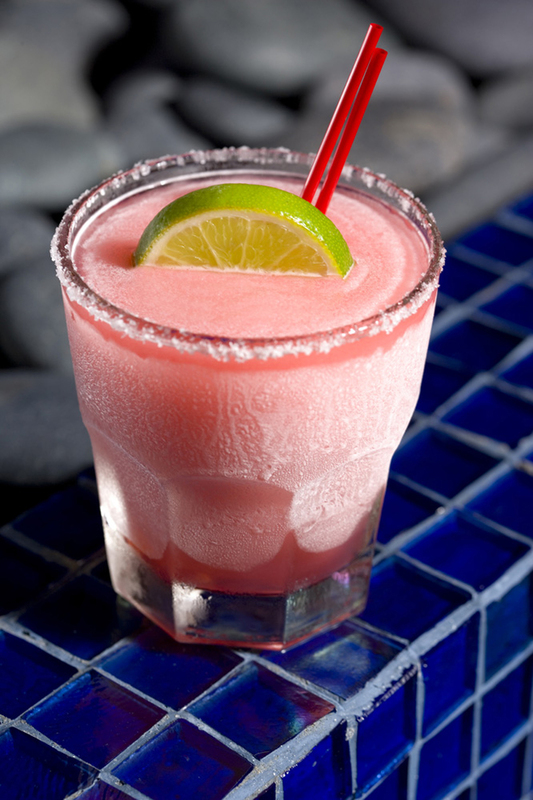 Rosa Mexicano's signature Frozen Pomegranate Margarita has been on the menu since 1984 (!). To mix it at home, look for POM Pomegranate juice in the produce department of your supermarket. Its easily batched for a party, too. Add all except garnish into a blender, and add 6-8 ounces of ice. Blend until smooth and frothy. Pour into a chilled rocks glass rimmed with coarse salt, and garnish with the lime wheel or wedge. Add all except garnish to a blender. Add 36-40 ice cubes, and blend until smooth and frothy. Pour into chilled rocks glasses garnished with coarse salt, and garnish with a lime wedge or wheel. Philadelphia's Square 1682 was recently voted USA Today's Best Hotel Bar. Their Cold Weather Cocktail Menu (aptly named for the past few weeks' weather...) explores the trend of fortified wines, and Lead Bartender Chauncy Scates' Pink on Pink cocktail is a great introduction to Vermouth.
" I find a lot of people have misconceptions about fortified wines and Vermouths," she says. "I wanted to do a really silly but straightforward drink to expose more people to the deliciousness of fortified wines." Since it's vodka-based, Pink on Pink is light and easy drinking, and the Lillet Rose adds a nice delicate tough. Add all ingredients except garnish to a cocktail shaker. Add ice, and shake until Chilled. Strain into a chilled cocktail glass, and garnish with a lemon twist. I love a good Manhattan--especially at this time of the year. My basic recipe is 2 ounces Bourbon, 1 ounce Dolin Red Vermouth, and a few dashes of Woodford Reserve Spiced Cherry Bitters, stirred and served over one large cube. But sometimes, I like to mix it up a little. Nothing too crazy, but just a tweak here, or a riff there. Wabeck uses a melon baller on apples, stains them with grenadine, compresses them, and poaches them in a Cryovac. The end result looks like a cherry, (and has some of the flavor of Maraschino cherries, thanks to the grenadine), but with a decidedly different texture. He uses one to garnish his Apple Manhattan, pictured above (I cheated and used Luxardo Maraschino cherries, though.) Here's his recipe for the cocktail--the Applejack adds a very subtle apple flavor, and substituting Peychauds' for cherry or Angostura bitters ramps up the spice. Add all except garnish to a cocktail shaker. Add cracked ice, and stir until well chilled. Strain into a chilled rocks glass that has 1 large ice cube (or serve up in a chilled rocks glass.) Garnish with the apple ball or cherry. With temperatures in D.C. this weekend that are supposed to approach 70 degrees or higher, I'm not sure I'll be in the mood for a traditional seasonal sip like a Hot Toddy or mulled wine. Luckily, this cocktail from Hennessy is versatile: I can sip it cold when it feels like May in December, and warm when the mercury dips once again. Happy holidays! For a cold cocktail: Add all ingredients except garnish to a shaker tin, and shake with ice until well chilled. 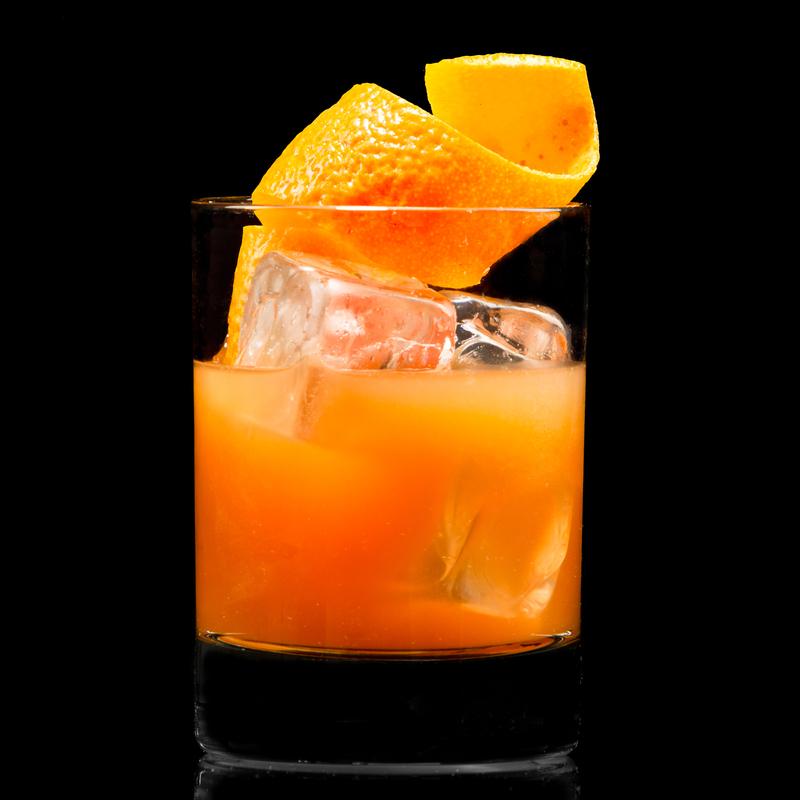 Strain into a Collins glass with fresh ice, and garnish with an orange twist. For a warm cocktail: Add all non-alcoholic ingredients (except garnish) to a pot, and bring to a boil. Remove it from the heat, and pour into a heatproof glass. Add all alcohol, stir, and garnish with an orange twist.